On this week's episode I am joined via the Skype machine with Tim Hall, The People's Critic! 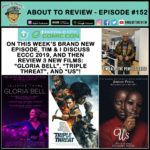 We start the show talking about Emerald City Comic Con 2019, and then review the films "Triple Threat", "Gloria Bell", and "US". Check it out! Episode 102 was resurrected from the ashes of a corrupted memory card & brought to you this week! This episode was recorded the weekend of Emerald City Comic Con 2018 with Tim, "The People's Critic" and Jess, and Damien from "The Curly Nerd Podcast".